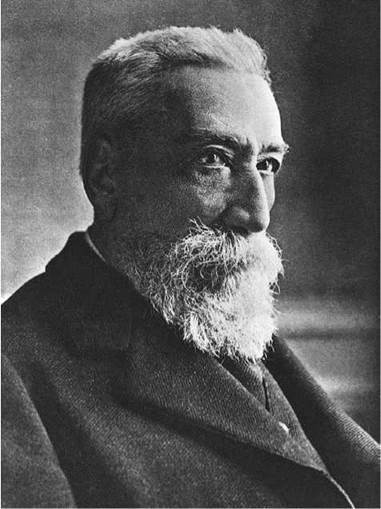 Anatole France. France, Anatole, photograph. The Library of Congress. During his lifetime, French author Anatole France, was widely recognized as his country’s greatest author. He distinguished himself in two widely diverse areas of literature—wistful storytelling and biting satire—and gained immense popularity with such works as My Friend’s Book (1885). After his death, France’s reputation suffered a marked decline and is at present undergoing reevaluation. Youth in the Second Empire. Anatole France was born Jacques Anatole Francois Thibault in Paris on April 16, 1844, the son of a self-educated bookseller. When France was only four, his country underwent yet another in a series of political transformation. The monarchy of Louis Philippe began seeing events of violent opposition in Paris in 1848 that eventually resulted in his removal in favor of Louis Napoleon Bonaparte, who served as president of the Second Republic until 1852. This Bonaparte then declared himself Napoleon III and ruled France as emperor until 1871. The period of his rule is known as the Second Empire. France enjoyed average success during two years at preparatory school in St. Mary’s Institute, but his next seven years at the senior school, the famous College Stanislas secondary school, were painful. His diary and the comments of his Jesuit masters reveal the youth’s sense of inferiority, which led to indifference, carelessness, and outright neglect of schoolwork. Greater intellectual profit came to him from browsing among his father’s books and from friendships with influential customers. The most crucial influence on the impressionable youth was one of his father’s regular clients, Count Dubois-Dubais, an ardent classicist and admirer of the past whose wealth allowed him to develop and indulge his taste for finer things. The older man’s easy, carefree lifestyle appealed to young France. Took up Literary Life. During his late teens and early twenties, France was confronted with the necessity and the uncertainties of choosing a career, though he had the luxury of living at a time when his country was experiencing great material prosperity as well as colonial expansion. For a time, he had to be content with odd jobs. France assisted his father, worked as a teacher, and worked for a publisher at Bachelin-Deflorenne. Encouraged by his success, he applied unsuccessfully for the post of assistant librarian at the Senate Library. A few months later, in 1866, the sale of the family business made France’s search for security more urgent, and he found the courage to approach the young publisher, Alphonse Lemerre, who promptly hired him as an editor and manuscript reader. In his new position, France came in contact with the Parnasse poets, who comprised an anti-Romantic, art-for-art’s-sake literary movement during the mid-nineteenth century. By the mid-1870s France had not yet published any fiction, but he was well known in several Parisian literary circles. To augment his small writing income (mostly from prefaces, encyclopedia articles, and ghost work for Lemerre), which often left him dependent upon his parents for lodging, he finally obtained employment in 1876 at the library of the Senate. It had been only a year since the French Third Republic had been declared, which saw the separation of church and state as well as complete freedoms of the press, speech, and association implemented. In 1877, France married Valerie Guerin de Sauville, with whom he had one daughter before an 1893 divorce. Published First Novels. France began his fiction career with novels and stories of a highly conservative, conventional nature. His first critical and popular success came with The Crime of Sylvestre Bonnard (1881). The protagonist, a reclusive scholar unsuited to worldly dealings, was the first of many similar characters, who were to some extent based on France himself. Similar characters included Jean Servien from The Aspirations of Jean Servien (1882) and Jerome Coignard from The Queen Pedauque. As his fame grew, he began to treat more controversial themes with an increased tendency toward passion and love, as evidenced in The Red Lily (1894), and the stories in Balthasar (1889), works which illustrate France’s view of the church and social reform. The writing of the four-novel series ‘‘L’histoire contemporaine’’ spanned a period of great change for France. Until this time, France had never aligned himself with any political cause. However, during the composition of the third novel in the series, The Amethyst Ring, France became for the first time in his life actively involved with a social cause—the Dreyfus Affair. Politically Active. In 1894, Captain Alfred Dreyfus was convicted of treason and subsequently condemned to deportation to Devil’s Island, a small island located off the coast of French Guiana that was used as a brutal penal colony. The public had no reason to doubt the justice of the sentence, but in the following years, evidence emerged that cast doubt on the captain’s guilt as well as on the propriety of the government’s conduct in the matter. In a November 1897 interview, France said he could not approve of the verdict, since he had not been able to examine the evidence. After writer (Emile Zola published his famous open letter, ‘‘J’accuse,’’ in the January 13, 1898, Aurore to condemn the sentence, he was charged with defamation. France signed the ‘‘Petition des intellectuels’’ in Zola’s support the next day and then testified at his trial. France’s new involvement was reflected in the covert political and legal systems that became a recurring theme in his writing. The short story ‘‘Crainquebille’’ is probably France’s most well-known indictment of judicial injustice. As he grew in social awareness, satire became one of France’s chief literary tools, of which he made increasing use in such later novels as Penguin Island (1909), The Gods Are Athirst (1913), and The Revolt of the Angels (1914). In France’s later years, he was increasingly involved politically with the extreme left and for a time became a supporter of the French Communist Party, as did many intellectuals and artists of this period who generally stood in opposition to World War I. In 1921, he was awarded the Nobel Prize for Literature. He published his last book the following year, the novel The Bloom of Life (1922). France died six months after his eightieth birthday, in 1924. Adventures of Huckleberry Finn (1884), a novel by Mark Twain. Consistently named as one of the Great American Novels, Twain's most popular work takes satirical aim at institutionalized racism, religion, and society in general. Babbitt (1922), a novel by Sinclair Lewis. A scathing look at conformity in the American middle class and, as Lewis calls it, "boosterism," the act of promoting your town's outward appearance. Dr. Strangelove or: How I Learned to Stop Worrying and Love the Bomb (1964), a film directed by Stanley Kubrick. Loosely based on the Cold War thriller Red Alert (1958), by Peter George, this black comedy skewers the contemporary military mindset and the doctrine of ''mutual assured destruction." The work of Anatole France is characterized by urbanity, wit, taste, craftsmanship, astuteness, and rationalism. Not without reason was he called ‘‘The Master,’’ both in his own time and often in the large body of criticism that appeared after his death. However, France’s elegant style and subtle humor have not secured for him the same kind of enduring reputation enjoyed by his more revolutionary or politically involved contemporaries. To some, his work appears dated and sentimental. He wrote during a major change in the arts and literature, when old Europe was giving way to a vastly new and different modern Europe. To his contemporaries, however, France was a modern writer with the bravery to write biting, even shocking, satires of major cultural institutions. Rationalism and Skepticism. France adopted reason, in the French tradition, with a goodly dose of skepticism as a guide to living and thinking. He considered himself a rationalist. Rationalism is a school of thought in which human reason is considered the arbiter of truth. France was careful, though, to avoid giving human reason more credit that it deserved. Though France was scornful of religious dogma, he was nearly as suspicious of the dogmatic claims of science. Thus, France was also a skeptic, meaning he had a disposition to doubt that truth could ever be ascertained about certain things. While France received lavish praise from critics during his lifetime, he was ignored or disparaged after his death. The nostalgic sentiment of his early work appealed to fewer critical readers than it once had, and the social and political issues that inspired his satires are now primarily of historical interest. In the 1980s, a significant number of critics have offered favorable rereadings of his works. Critics who have reevaluated France have found a new and more complex appreciation for the artistic qualities of his fiction and his sophisticated handling of literary forms. In 1897, the year before the first collection of France’s Selected Texts appeared, Charles-Louis Philippe had written: ‘‘Anatole France is delightful, he knows everything, he’s even erudite; that’s why he belongs to a species of writers that is ending.’’ In 1916, Andre Gide had remarked that France’s work, while elegant and subtle, was ‘‘without anxiety’’—too clear, too easily understood, never disturbing his readers. Yet in 1921, when France was awarded the Nobel Prize for Literature, Erik Axel Karlfeldt, Permanent Secretary of the Swedish Academy, praised both the substance and style of France’s writings as worthy of his great predecessors, including Francois Rabelais and Voltaire, and called the new laureate the last of the great classicists and the most authoritative contemporary representative of French civilization. 1. Discuss France’s contributions to French literature. 2. Write a short essay in which you describe France’s use of satire in his apparently straightforward stories. 3. As a class, justify why France won the Nobel Prize in 1921 despite the fact that his literary reputation was already in decline. 4. What themes in France’s work make his writing uniquely ‘‘French’’? Do you think these themes helped fuel his popularity during his life? How might they have affected his marginalization after he died? Create a presentation of your findings. Axelrad, Jacob. Anatole France: A Life without Illusions, 1844-1924. New York: Harper, 1944. Bresky, Duskan. The Art of Anatole France. The Hague: Mouton, 1969. Cerf, Barry. Anatole France: The Degeneration of a Great Artist. New York: Dial, 1926. Dargan, Edwin Preston, Anatole France: 1844-1896. New York: Oxford University Press, 1937. Hearn, Lafcadio. Introduction to The Crime of Sylvestre Bonnard (Member of the Institute). New York: Harper & Brothers, 1890. Jefferson, Carter. Anatole France: The Politics of Skepticism. New Brunswick, N.J.: Rutgers University Press, 1965. Levy, Diane Wolfe. Techniques of Irony in Anatole France: Essay on ‘‘Les Sept Femmes de la Barbe-Bleue.” Chapel Hill: University of North Carolina Press, 1978. Sachs, Murray. Anatole France: The Short Stories. London: Edward Arnold, 1974. Tylden-Wright, David. Anatole France. New York: Walker, 1967. Virtanen, Reino. Anatole France. New York: Twayne, 1968. Conrad, Joseph, ‘‘Anatole France.’’ The Living Age 24, no. 3140 (September 10, 1904). Journal of the History of Ideas. (January 1972). Nation (November 5, 1924); (April 22, 1944). New Republic. (September 7, 1932); (December 7, 1932); (October 24, 1934). Nineteenth-Century French[BA14] Studies. (Fall-Winter 1976-1977). ‘‘Recent French Literature.’’ Nation 41, no. 1047 (July 23, 1885): 75-77. Times Literary Supplement (London), September 29, 1966.